A Design Process by Kosibah. 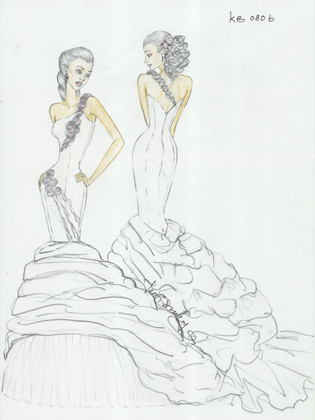 Follow the progress of a designer wedding gown from design sketch to reality A Design Process by Kosibah. It all starts with the design sketch which the designer will create during your initial appointment. The design will take into account any ideas you may have, together with the best judgement of the designer as to what will suit your body shape. Other considerations are the type and size of the venue and your budget. Each design is created individually for each client. 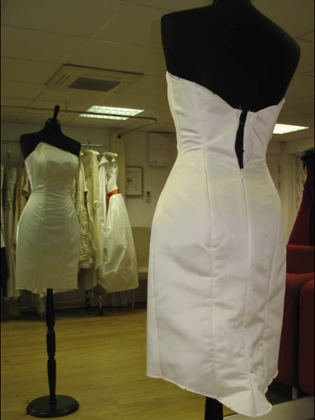 Ensuring a perfect fitting wedding dress You will have at least one toile during your fitting process. The toile is the mocked-up version of the dress in calico so that the designer and you can be sure that the fit is absolutely perfect. The toile won’t have all the embellishments of the final dress but you’ll get a good idea of the shape and how the final dress will look and feel once worn. 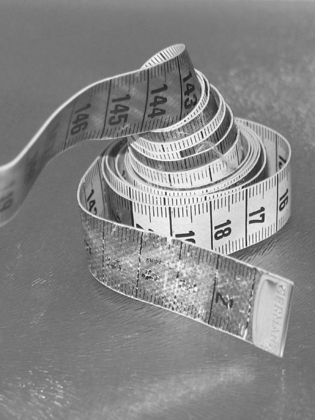 Any alterations and amendments required from the first toile fitting (if necessary) are incorporated into the second toile. You will have as many toile fittings as necessary to ensure that you and the designer are happy to proceed to the fabric stage. 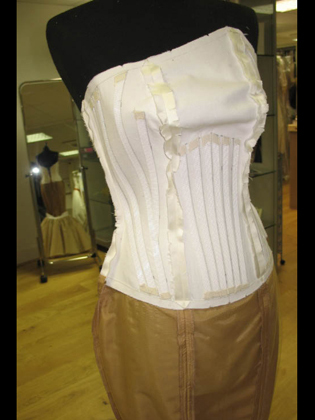 This picture shows the integral corset and underskirt. This is the secret support that creates the cinching in of the waist. Corsetry is our specialty. It gives support – you won’t need a bra on your wedding day – and the bones are carefully placed to follow the natural contours of your body. 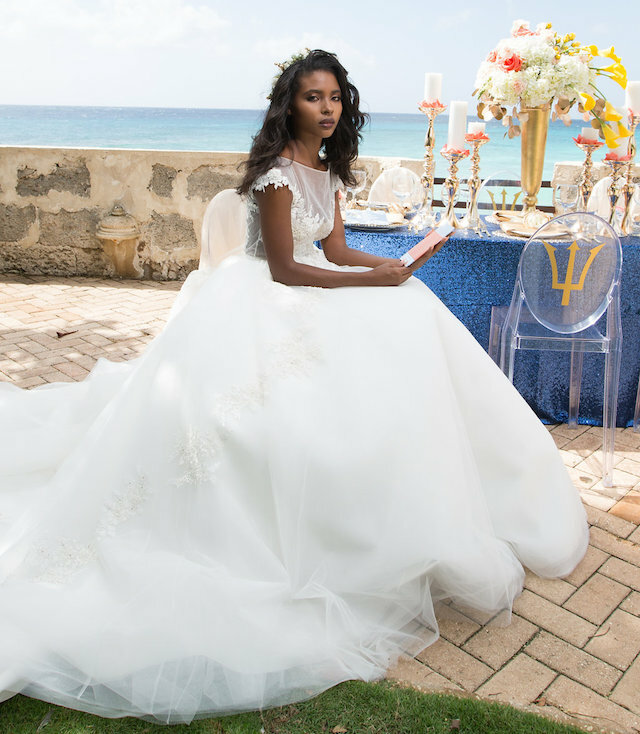 You can be sure that your wedding dress will be one of the most comfortable dresses you have ever worn – our clients say that a couture dress feels like no other. 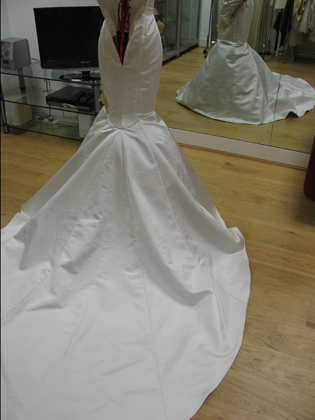 This is the upper outer shell of the gown – the part that everyone else sees – but before any embellishments are added on. 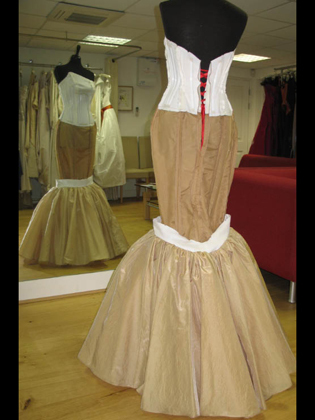 We use a variety of luxurious fabrics in our dresses: duchesse satin (as here), zibeline, organza, mikado, gazar and various laces. The choice of fabrics is up to you. 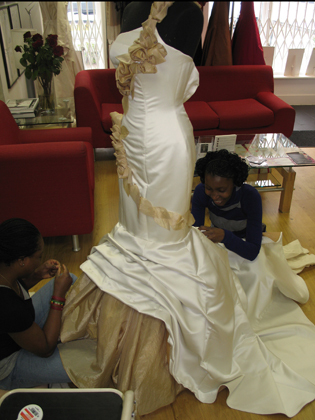 This is the way the skirt looks before it is hand ruched and pinned to form the distinctive ruffled look that you can see in the finished gown. 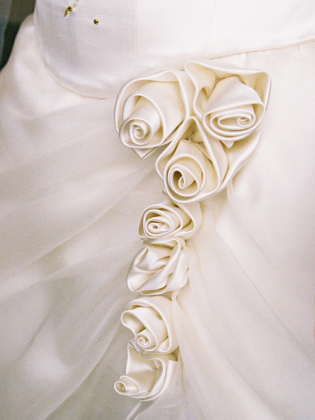 This dress is embellished with hand-made organza roses which are then hand-stitched onto the bodice and neck strap. Ruching is the process of manipulating the fabric to form a pleat or fold. This gives more interest and texture to the skirt. 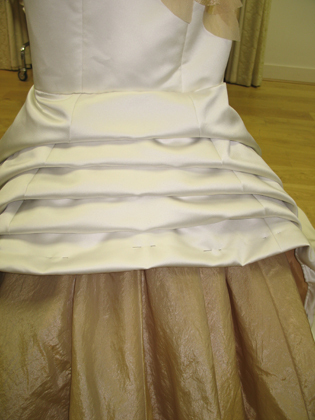 The folds are carefully formed by hand, pinned in place and then hand-stitched revealing the organza underskirt. The train is picked up to form wave-like folds and pinned in place. The ruching that has been pinned into place on the front and back, is then meticulously hand-stitched. Some of the haute couture embellishments we give our designer wedding dresses. 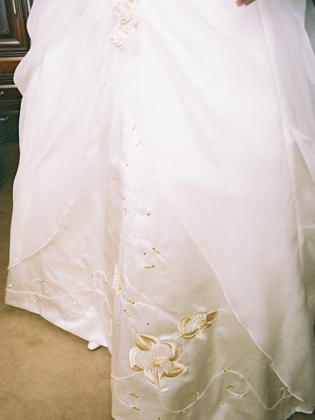 We can embellish our dresses in a number of ways, depending on the client’s requirements. Here our bride specified fabric roses which were made in the same duchesse satin as the dress itself and then hand-stitched into place. 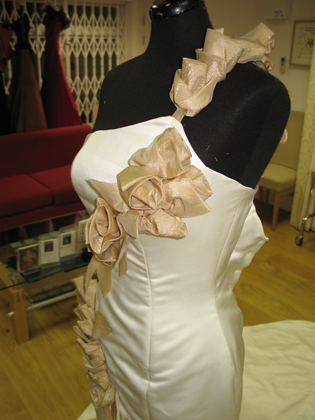 Some of the haute couture embellishments we give our designer wedding dresses. 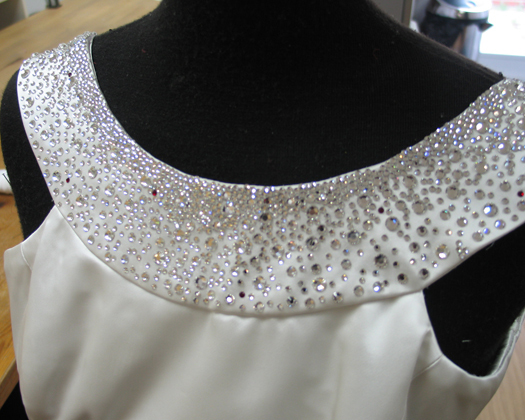 Our client specified beading with different-sized and coloured swarovski stones which were individually applied to create this beautiful raindrop-on-glass effect on the collar. Some of the haute couture embellishments we give our designer wedding dresses. Another part of the same dress as the previous design. 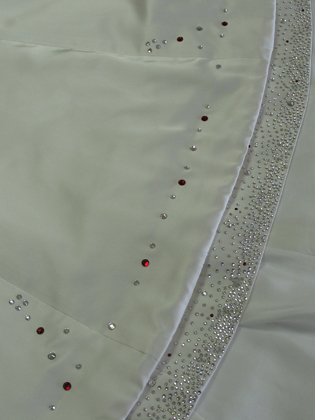 This shows the hemline where we mirrored the collar’s effect with swarovski stones. Some of the haute couture embellishments we give our designer wedding dresses. This skirt hemline shows embroidery and beading which incorporated crystals and pearls. The result: a rich textured look. Some of the haute couture embellishments we give our designer wedding dresses. 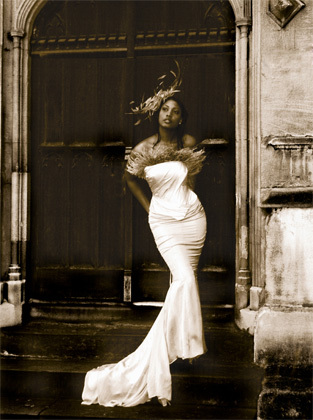 Sometimes our clients want us to incorporate fabrics that have a special significance or meaning into our gowns. 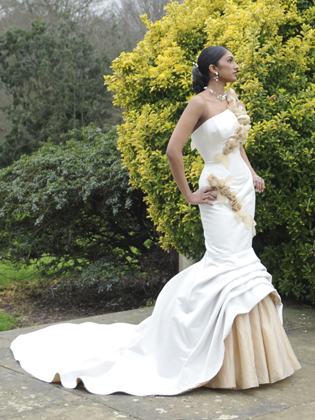 This example shows deconstructed sari fabric that enhanced a traditional wedding dress. 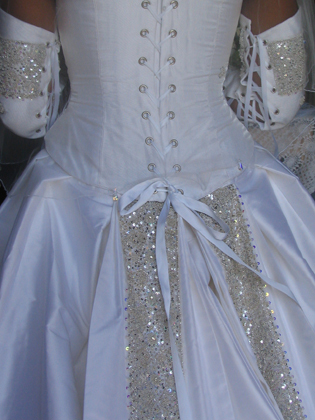 Full view of the finished gown. The culmination of the many hundreds of hours labour. 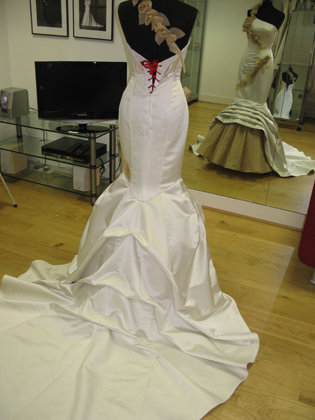 Back view of the finished gown. 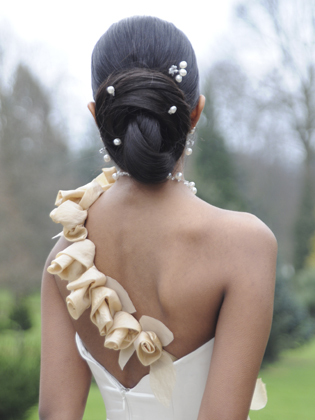 Back view of the gown showing the fabric organza roses.